To help you choose the right aluminum can crusher for your needs we have gathered a list of the best aluminum can crushers you can currently buy. This list includes various types of crushers such as vertical, horizontal and portable can crushers. THE CRUSHER is one of the best and most popular single can crushers on the market. This tool is made by a company called Pacific Precision Metals, which has done a great job designing and manufacturing the tool because it not only looks appealing, but also is very durable. Pacific Precisions Metals THE CRUSHER is a vertical crusher, which means that it must be installed to a wall or other vertical surface. The construction of the crusher is made from a durable steel material and the product by default comes in a white color, although other color options are also available. 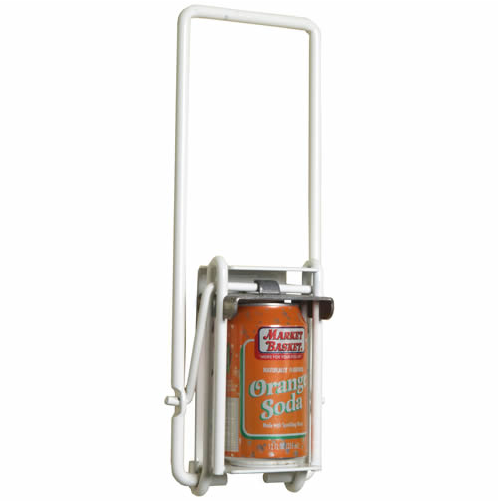 The maximum can size this can crusher will compress is 16 oz, so it can also take smaller 12 oz aluminum cans. 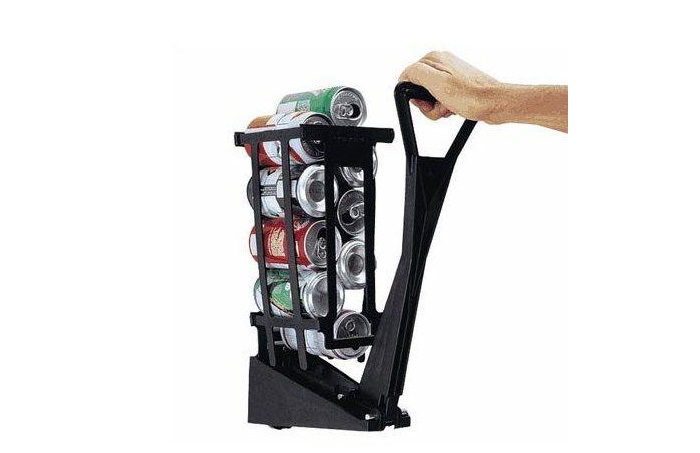 This allows to crush most soda drink and beer cans. THE CRUSHER will also compress cans to a very small size of 1 inch and less, which is impressive and will allow to save a lot of space in the trash. THE CRUSHER comes with all mounting hardware needed to quickly install it to a wall. Pacific Precision Metals THE CRUSHER is very easy to use, the handle fits nicely in the hand an allows to quickly crush empty aluminum cans. The installation of the tool should not take you a long time. What I would like to see improved on this can crusher is a bit more durable handle and some sort of fix so that cans that are not aligned correctly in the middle does not pop out while crushing. Also an automatic dispensing of crushed cans would be a useful addition. Other than that this is a great looking tool that should work for years. The size of the crusher is 6.8x3x4.4 inches (42.6×7.62×11.2 cm). Basic Industries International 77703 is a simple looking but effective can crusher. It has got an all steel body and is packed with useful features that speeds up the crushing process a lot. First we need to mention that this is a vertical or wall mounted crusher. The thing I like about this aluminum can crusher is its very simple design, it is not the most attractive crusher, but seeing and touching the unit immediately shows the practicality and durability of the tool. All parts of the crusher including the crushing handle and can storage basket are made from a stainless steel, which is coated, so the tool can be used outdoors. 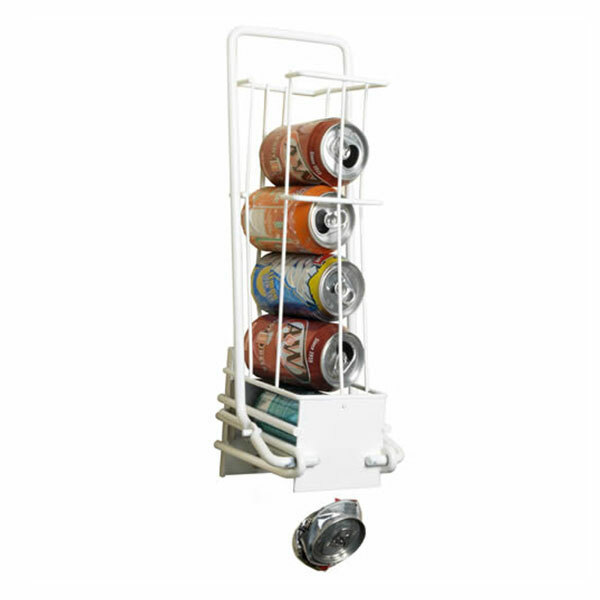 Basic Industries International can crusher will compress cans up to 12 oz size, so it cannot be used with larger 16 oz beer cans. The tool will crush aluminum cans down to approx. 1 inch size which is pretty decent and should save 4 times more space in trash than regular, uncompressed cans. What really makes this product shine is its semi-automatic crushing functions. Basic Industries International 77703 crusher has got a can holder basket on the top, which can hold up to 6 12 oz aluminum cans. When a can gets crusher it automatically ejects trough an opening on the bottom of the crusher, so you can place a garbage can directly under the crusher and a compressed can will fall inside the trash. This allows to speed up the crushing process quite a lot, as you don’t have to place a can into the crusher, crush it and take the compressed can out repeating the process for each can. What I would like to see on this crusher is a soft grip handle like for other can crushers out there, which provides more comfort for hand, especially when you need to crush a lot of cans at a time. 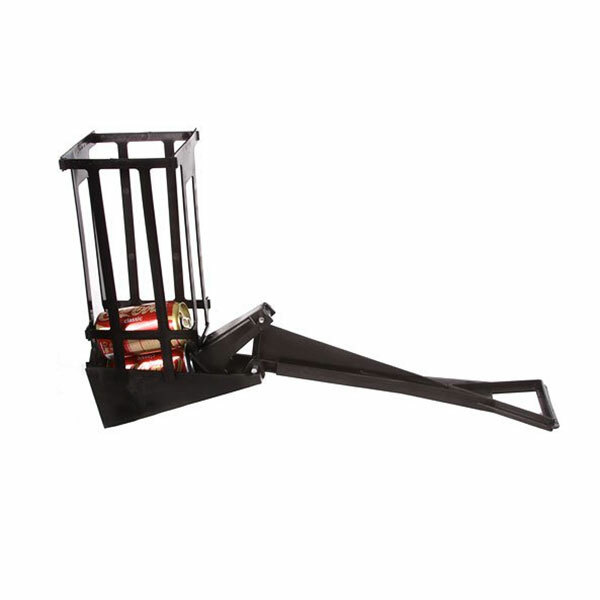 Also the frame of the crusher could be more durable, although this is one of the sturdiest semi-automatic can crusher, and at a 20 dollar price you could not find a better crusher than this. The size of Basic Industries International aluminum can crusher is 5.7x8x18.2 inches (14.4×20.3×46.22 cm). Easy Crush Can crusher by Pacific Precision Metals is one of our favourite 12 oz can crushers. The crusher looks very simple, but actually is a durable tool that can compress aluminum soda and beer cans with up to 12 oz capacity. Easy Crush can crusher is a wall mountable unit and needs to be mounted to a sturdy surface such as wood. Crusher has got an all steel metal body, which in opposite to cheap steel can crushers is very durable and will work for years. The base of the crusher has got white powder finish and the tool actually looks good, despite its simple looks and can be installed indoors, in places such as kitchen without worry that it will look oddly. However the white powder coating will scrape off quite fast after short time. The crushing handle also is made from steel, however there is not a soft grip at the end of the handle. Easy Crush aluminum can crusher is made in the USA, which points to the high quality of the tool. Easy Crush can crusher compresses cans down to just 1 inch size. 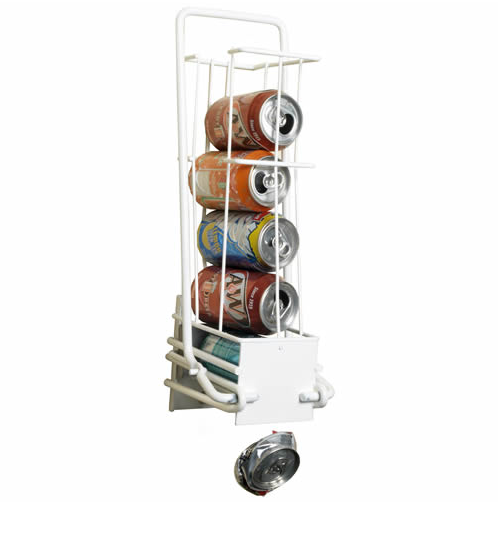 This is a basic can crusher, which does not offer features like multiple can holder or automatic dispensing, so you have to put in and take out all cans one by one, so this also isn’t the most fastest can crusher. But the great thing about this crusher is its durable steel body, you don’t have to worry that the construction will start to bend or break on heavier use like with cheaper steel crushers. 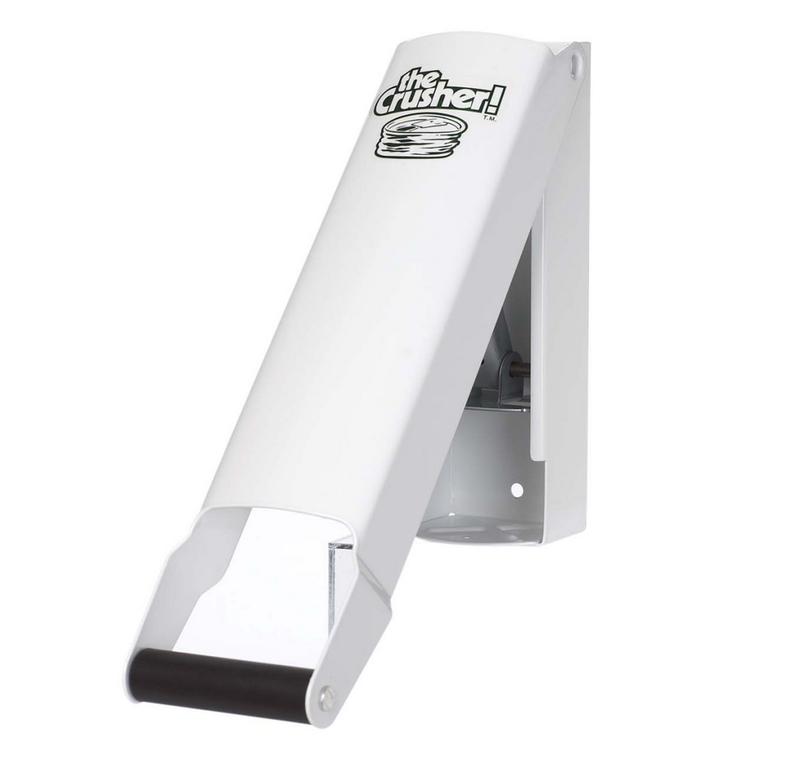 Easy Crush can crusher comes with all mounting hardware needed so you can quickly mount the tool to a wall. The size of the tool is 15.4×5.7×3.3 inches (39.1×14.4×8.3 cm). MasterCrush is one of the few can crushers that can handle cans with capacity up to 32 oz. The tool is made from a durable steel material and has got one of the sturdiest constructions between majority of crushers. Although the price of the tool is higher than for most other manual can crushers costing about 50 dollars, this tools is still worth the price. As mentioned the crusher is made from stainless steel, so it can handle any aluminum beer or soda can, however I would not recommend to use the tool with cans made from steel or other durable metal as it may damage the tool. 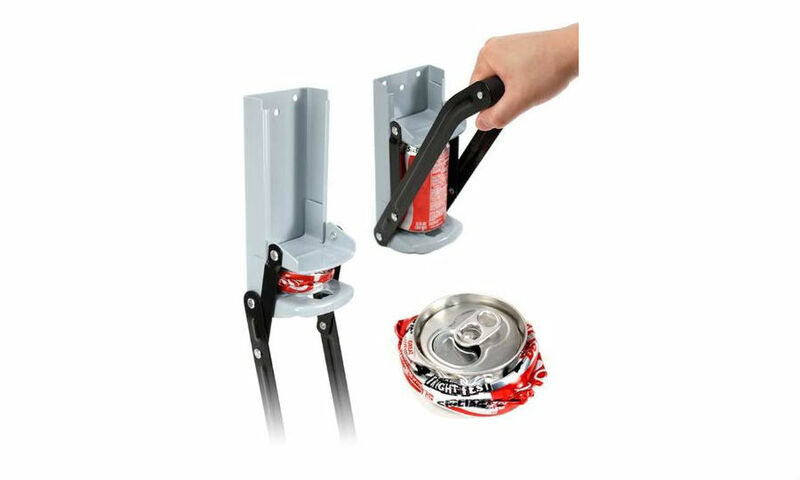 MasterCrush aluminum can crusher will compress up to 32 oz large cans, which means that it will work with practically any beer, soda and even larger energy drink cans. The tool is designed in a way to be able to compress not only aluminum cans, but also smaller plastic bottles. MasterCrush is also a multi position tool, so you can mount it both vertically on a wall or horizontally on a table, however we recommend mounting it vertically to a sturdy wall, because it will make compression of cans or plastic bottles more easy. From the design this is one of the best looking can crushers, painted in a black color with powder coating that allows to use the tool outdoors. The paint job of the tool has got a high quality so you can install the crusher in any place and it will fit the interior of that place. MasterCrush can crusher has a long handle that comes in two pieces, you can unscrew the top part of the handle off for easier transportation. At the end of the handle there is a foam grip, which makes using the tool more comfortable if you need to compress large amount of cans. But this is also the weakest point of the crusher, where it might break if large force is being applied to the handle. MasterCrush comes with all mounting hardware and instructions needed to install the tool. MasterCrush can crusher is made in the USA, so you can expect high quality out of this tool. I would like to see more features on the crusher such as automatic can dispensing or collection bin, but even without these features, this is still one of the best aluminum can crushers on the market. Dimensions of MasterCrush crusher are 9×3.7×4 inches (22.7×9.3×9.7 cm). Don’t have a place to install a large wall mounted can crusher or don’t want to use a horizontal table top crusher? Than this foot operated can crusher by Kitchen Craft is suited for you. 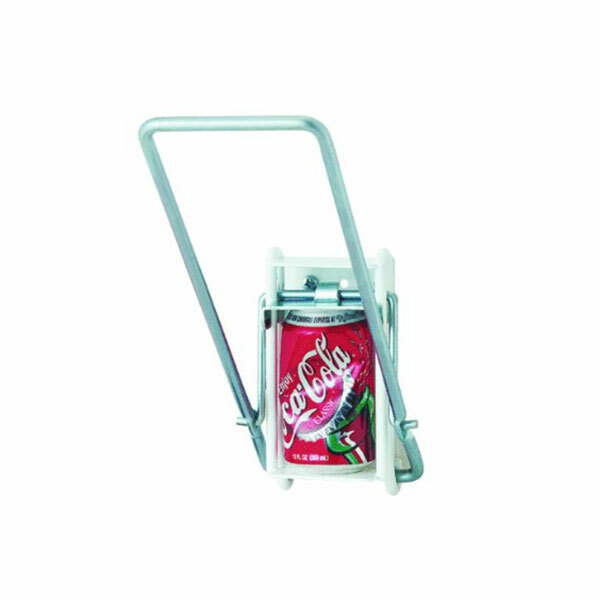 Kitchen Craft can crusher is a portable, foot operated can crusher that can compress not only aluminum drink cans but also thicker steel food cans, making it one of few manual can crushers that can compress steel cans. The crusher is made from a durable steel, which allows to compress these types of cans with ease. Not only this tool can handle cans constructed from durable metal, it also is packed with many other useful features. First of all the crusher can take cans up to approx. 20 oz capacity, so you can compress most soda, beer cans or steel food cans. The crusher is operated by feet, you need to place an empty can between two metal plates of the crusher and than stomp on the top plate to compress a can. The crusher must be placed on a horizontal, level surface to crush cans. To secure cans into position while crushing them this tool has got a support bar with two positions, first will hold smaller aluminum drink cans into place, while larger position can be used for large beer, energy drink and steel food cans with up to 20 oz capacity. There is also a pierce screw on the top plate, which helps to compress more durable steel cans, and this screw can also be adjusted to fit cans at various thickness. Another handy feature is a magnet on the top of the crusher that helps to distinguish aluminum cans from steel cans for recycling purposes. 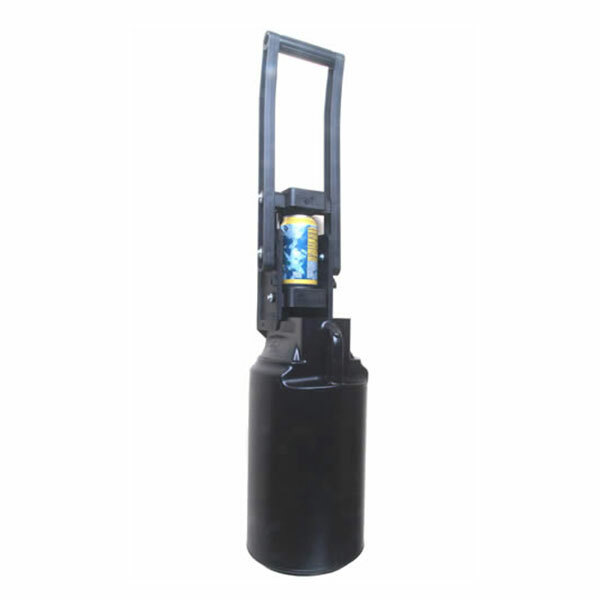 From design, this crusher has got a metallic black color, on the bottom of the tool are rubber feet that helps to secure the crusher in place when stepping on it to crush cans and also protects the surface a crusher is placed on from scratches. There also is a hanger on the back of the crusher, so you can hang the crusher in a closet or on a wall when not using it. What I like about Kitchen Craft can crusher is that it compresses not only aluminum but also steel cans and that it can take larger than 16 oz cans, also all the small features such as pierce screw or magnet are also very useful. What I don’t like about this tool is that it does not compress cans to as small size as most vertical can crushers and also that vertical can crushers allow to compress cans faster than this foot operated crusher. Other than that this is a great tool for crushing drink and steel food cans. The size of the crusher is 14.8×5.4×1.8 inches (37.8 x 13.8 x 4.6 cm). Most aluminum can crushers tend to look very similar or use the same principle for compressing aluminum cans, so most of them have the same faults. However, this Easy Pull can crusher by Easy Pull Products is one of the best aluminum can crushers on the market, when we look at the usability, durability and design of the crusher. Before the review we must mention that this tool is also manufactured in the USA. 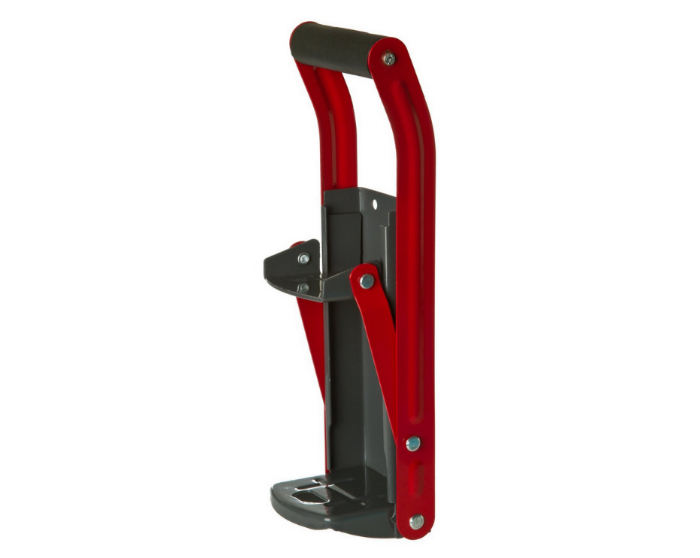 Easy Pull can crusher is a vertical, wall mountable tool. The crusher will compress cans up to 12 oz capacity, which is practically the only drawback I could find on this tool. So if you are using larger than 12 oz cans this tool won’t suite your needs. 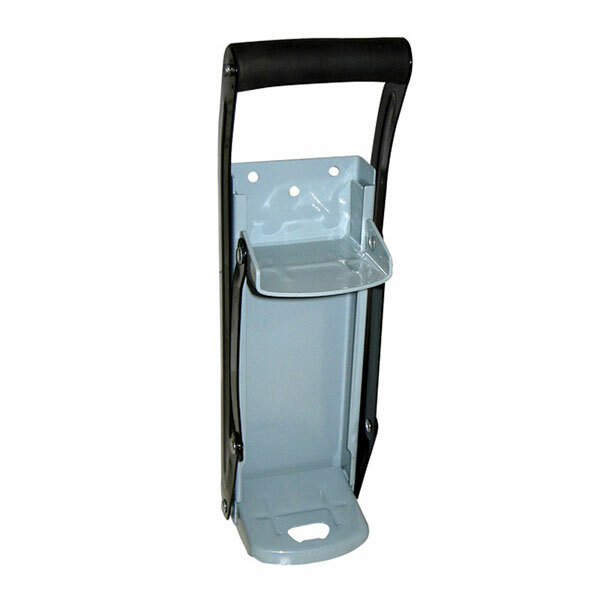 The body of the crusher is made from a durable, glass filled nylon. Yes, nylon is a plastic material, which may not seem as durable as steel, but actually can handle quite easy tasks such as aluminum can crushing without problems. All moving parts of the crusher such as bolts or hinges are made from stainless steel or aluminum to give the tool extra durability and provide longer work life. The body of the crusher is in a black color and it won’t rust, because of the nylon material. However, manufacturer says that you should install the tool indoors. What I really enjoyed about Easy Pull crusher is how easy it is to use. The long handle and clever crushing mechanism allows the crusher to be used also by children and old people as compressing cans takes practically no effort. Also Easy Pull Products have solved the problem with cans popping out in the crushing process, so using this tool is also very efficient. Another great feature of the crusher is automatic dispensing system, compressed cans drop out at the bottom of the crusher, so you can place a trash can under the crusher. Easy Pull Products also offers to purchase the crusher with a can collection bin that can store about 40-45 compressed 12 oz aluminum cans. The collection bin is 16 inches (41 cm) tall and will cost a little less than 20 bucks. The can collection bin also is easy to clean and has got a drain plug in the bottom, so you can drain any leftover liquids from the bin. 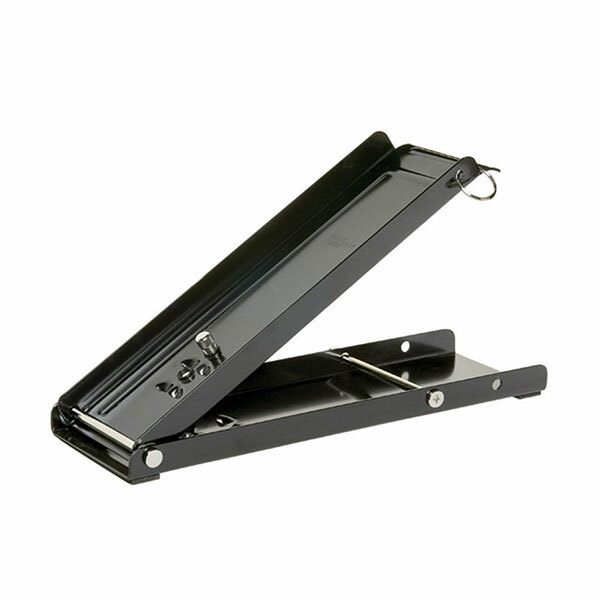 Easy Pull can crusher comes with all mounting hardware needed for installing the crusher. The size of the crusher is 19.8×6.5×4 inches (50.2 x 16.51 x 10.16 cm). What I love about this aluminum can crusher is the company that makes the tool. Easy Pull Products has got one of the best customer services and they offer amazing 5 year warranty for this can crusher, so you can be sure that this is a reliable tool that is going to last. Can Ram is a semi-automatic can crusher that makes crushing of empty aluminum cans a lot faster and efficient process. This is one of the fastest semi-automatic can crushers thanks to multiple can holder and automatic dispense features. The crusher is made from a nylon material, which is type of a plastic, but as seen on few other can crushers, is durable enough to compress aluminum cans. The nylon material also makes this tool more attractive (painted in black color), lighter and also rust proof. Can ram is a vertical can crusher that must be installed to a wall. Can Ram will compress cans up to 16 oz size, which means that the tool can also be used to compress smaller 12 oz cans. As mentioned the crusher has got a multiple can holder on the top of the tool. You can place up to 10 16 oz cans into the basket and compress them one by one, which noticeably speeds up the crushing process. Also, each can gets automatically dropped below the crusher, so you can place a trash can below to collect compressed aluminum cans. The interesting part about this Can Ram can crusher is the way you need to push the handle to compress cans. On most crushers you need to pull the handle down to compress a can, however on this tool you need to push the handle upwards, which makes crushing process a bit awkward. There are also some small problems when using the tool such as cans sometimes need to be rearranged into the can holder basket and the plastic of the can holder is not that durable. Also the crusher will sometimes not fully compress a can, so you will need to push the leveler twice, which slows down the crushing process. Other than that, this is a fast semi-automatic can crusher that you can buy for less than 15 bucks. The size of Can Ram crusher is 23.3x16x18.9 inches (59.2×40.6×48 cm). Prepworks from Progressive SC-90 is a wall mountable can crusher with a common design you have probably seen on many other can crusher. I choose this tool in opposite to other aluminum can crushers with the same looks, because it seems to be made from a more durable steel material and has got other color options than metallic grey. 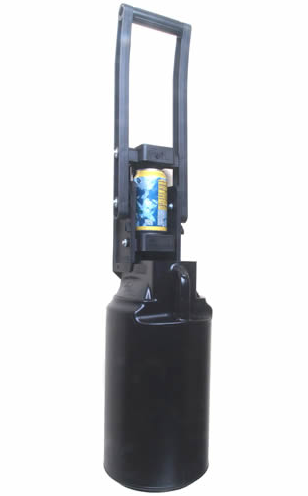 SC-90 is a vertical can crusher that needs to be mounted to a wall. 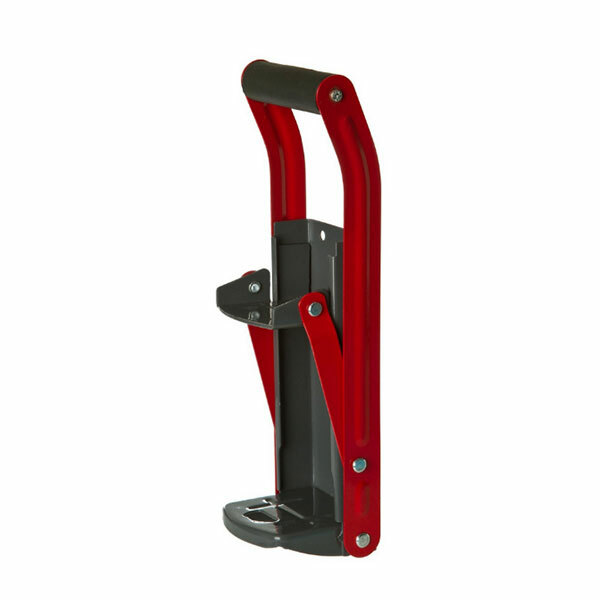 The crusher is made from a durable steel material and comes in a red and metallic color. This can crusher actually looks pretty good when compared to other crushers with similar design and should fit various interiors. The body of the tool is coated so it can be used both indoors and outdoors. Prepworks from Progressive SC-90 can crusher will compress cans up to 12 oz size, so it cannot be used to compress larger 16 oz cans. The crushing process is quite easy thanks to the long handle with soft grip, which makes crushing a lot of aluminum cans at a time more comfortable. There is also a bottle opener at the bottom of the tool. Few things that you must know when using this crusher is to pinch a can in the middle, to take pressure off the crushing mechanism and also remember to lube the moving parts after some time to prolong the lifetime of the tool. All in all this is a decent 12 oz can crusher considering that it costs just below 15 dollars. The size of the tool is 12.5×4.2×3.2 inches (31.7×10.6×8.12 cm). Commercial Zone Can Pactor is a combination of a can crusher and a recycling bin into a single tool. This is a portable tool that you can place in any indoor and outdoor place, for example in you room or backyard when you are hosting a party, so that everyone can recycle and throw their empty soda or beer cans into the trash. There are few other can crushers that come with a recycling bin, but none of them have such a large capacity collection bin that can store up to 400 cans. The crusher comes in two parts, the crushing unit itself and the recycling bin and the crusher can easily be detached from the collection bin and replaced if needed. Both the crusher and the collection bin are made from a durable, high density plastic, so the tool won’t rust when used outdoors. This can crusher is made in the USA, so you can expect high quality of this tool. Commercial Zone Can Pactor will compress cans up to 12 oz size. Can Pactor is not an automatic can crusher as you might think from the first look, so you must crush cans one by one manually. The crusher itself is mounted in a slightly tilted angle so when a can gets crushed it automatically drops into the recycling bin. This process makes the tool somewhat semi-automatic, as you don’t have to take each can out with your hands, but in real life cans sometimes do not fall into the bin, so you have to slide them in with a hand. The crusher compresses cans slightly different than other, wall mountable can crushers, which compress cans from the top. This tool will crush a can in the middle, so a can compressed by this crusher takes a little more space than one compressed by a vertical can crusher. However, thanks to the large 30 gallon (113 l) capacity recycling bin that will hold up to 400 compressed 12 oz aluminum cans this should not be a real problem. 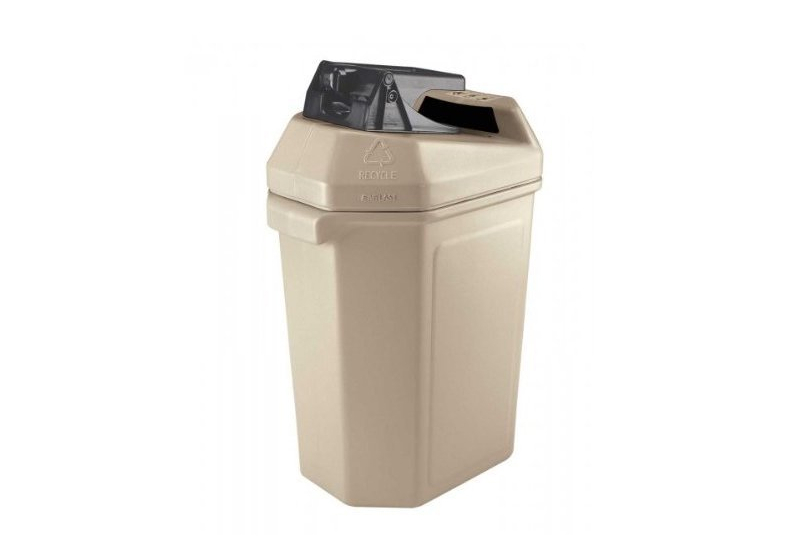 The crushing unit comes in a black color and the collection bin is in a beige color. The size of the crusher with can collection bin is 22x16x33 inches (55.9×40.6×83.8 cm). 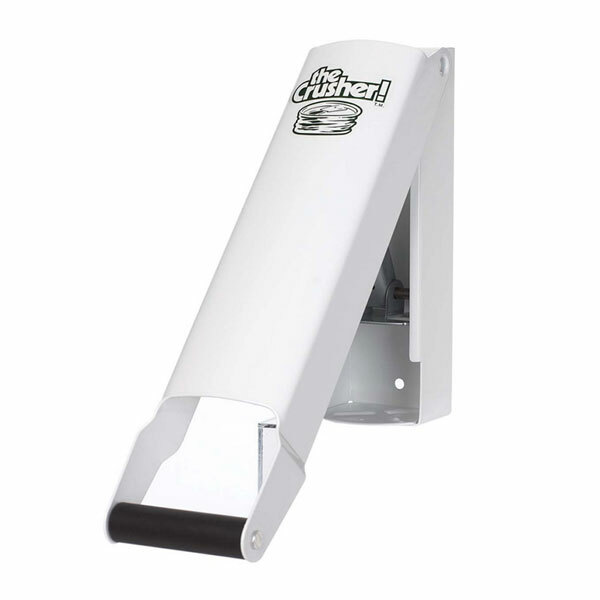 Valley can crusher is a simple looking tool that will compress aluminum cans up to 16 oz size. You might have seen other aluminum can crushers with quite a similar design, however this tool is one of the most popular steel can crushers and there are good reasons for that – it can handle larger 16 oz cans as well as smaller 12 oz cans and it costs below 10 bucks. Valley can crusher is made from a heavy duty steel material and has got a powder coat finish, so the tool can be used outdoors. Can crusher has got a classical metallic grey color with black handle. 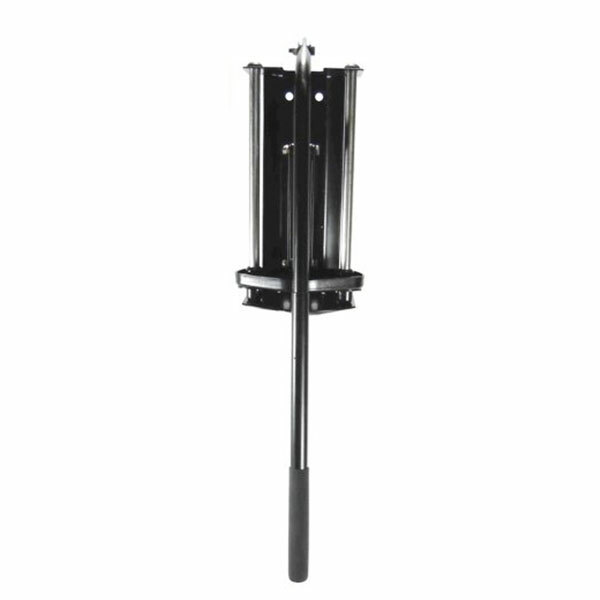 Valley can crusher is a wall mountable tool and it must be installed to a sturdy place such as a wooden wall. To ease the crushing process this tool has got a long handle with a soft rubber grip at the end. The crusher is easy to use and compressing 12 oz and even larger 16 oz cans should not cause any problems. As mentioned the unit is wall mountable, there are 4 screw holes on the crusher so you can quickly mount it to a wall. It comes with mounting screws, however they are pretty bad for a crusher that is made to crush 16 oz cans, so I recommend replacing them with more durable screws. Also as with most of these cheaper can crushers I recommend pinching a can in the middle before inserting it into the crusher to take pressure off the tool and protect moving parts such as the handle or crushing mechanism from breaking. Although the construction of the crusher is not the most durable one and the handle particularly is the weak point of this tool, the fact that it crushes up to 16 oz large cans and that it costs below 10 dollars makes this a good option for those who occasionally need to crush few aluminum soda or beer cans. 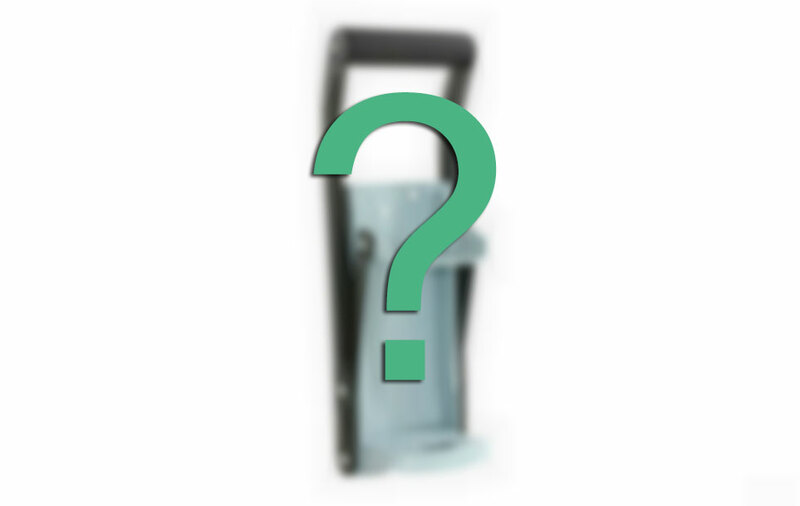 The size of this can crusher is 21.25×4.75×3.2 inches (53.9x12x8 cm). Recycling is the action when we take the products we have already used and either re-purpose them ourselves or collect them and then give them to the institutions that are equipped to recycle different materials into new products. And even thought by recycling you do good to yourself, the biggest beneficiary from recycling still is the environment, because recycling starts many processes that benefit the environment. First, the recycling process not only allows us to give our waste a new and second life that will slow down the rate of which we pollute our planet with landfill produced gasses and factories that produce new products, but also can create more Eco-friendly situation for our environment that way saving our planet by lessening the harm we do to it. Second, recycling also reduces the amount of natural resources we use in our day to day lives, because it takes much less energy to recycle trash than to create new things from raw materials, therefore by recycling we can use less energy, water and other precious resources and over all preserve and conserve the environment we live in. And third, recycling can help the economy too, by cutting down production and transportation costs of different products and lessening the need for energy and fuel, which if a country buys them from other countries can save one a lot of money. In the last stage a very thin sheets of aluminum are made from the large aluminum ingots by passing them trough special rolling mills, which flatten the large ingots into thin aluminum sheets. These sheets are then used to make various aluminum products, for example aluminum cans. 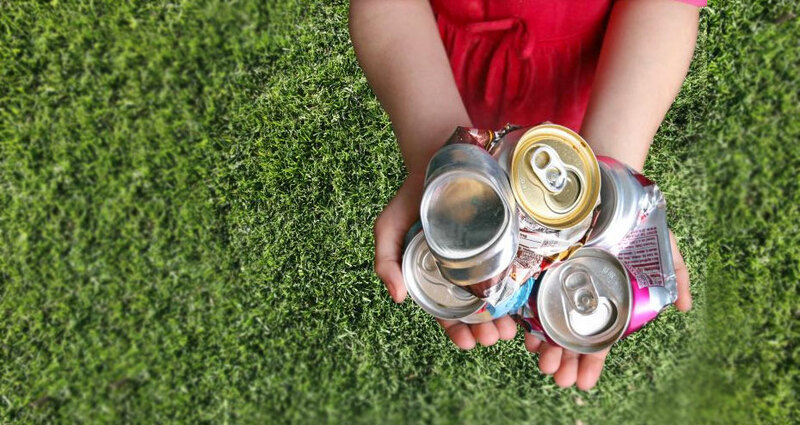 Aluminum cans are one of the most recycled materials, because they are fun to recycle using can crushers or simply the force of your arms, and because they won’t break down in regular landfills so they take extra care to be properly disposed. 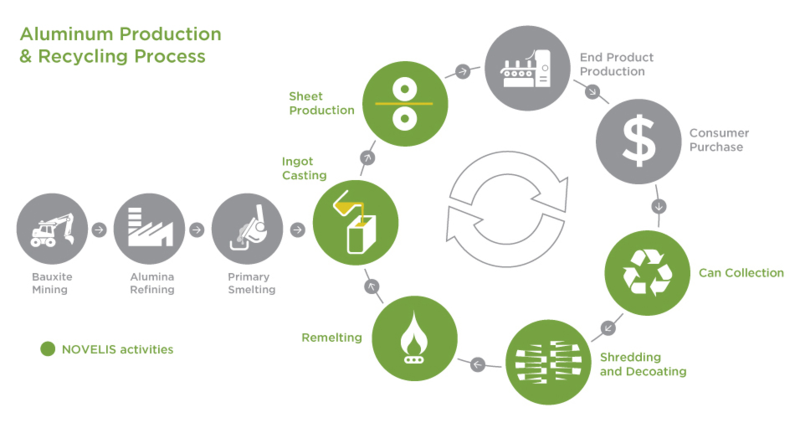 But there are many more materials that can be efficiently recycled. 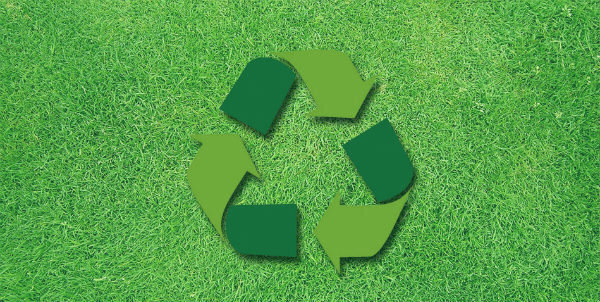 For example paper and cardboard, if collected and later delivered to proper recycling plants, can be recycled into new paper that will eliminate the need to cut down more trees to create paper. Also plastic of all kinds can be efficiently recycled to create many different things from clothes to new plastic objects, which is good, because the decomposition age for plastic is from a few hundred years up to even a century. Then a great material for recycling is glass as well, because everything from glass bottles and dishes to old windows can be recycled to create new glass bottles, fiberglass insulation, construction fill and other new glass objects. Also old electronics from cell phones to computers can be recycled into new materials that many times are used to create new electronic and of course food waste too can be recycled into compost that can be used as great fertilizer for plants to give them additional nutrients. Lately green living has become very popular because people are starting to recognise more and more how important it is to live in a way that doesn’t harm the environment. Actions to take to start a green living lifestyle are everything from recycling and pollution reduction to nature conservation and helping the nature to cultivate new life by planting trees and preserving natural habitats. And by doing all these things and living green you will be able to help the environment to thrive, but that is not the only thing that green living is good for, although many times it is the biggest reason why people want to start living green. Living green also lets you live in a more sustainable environment and make the planet around you that way too, which will preserve the nature and environment the way it is longer, and decades from now we won’t need to learn to live in much different world without natural resources and nature as it is now. And ultimately green living means that you can kill two birds with one stone – help the environment and preserve it while bettering your own life quality and reducing your costs, because green living is a more conscious living that doesn’t require as many things and products for you to be happy and sustained, leaving more time for you to just enjoy life and more money for you to save. Although recycling is one of the best and most beneficial action you can take to help the environment there also are other things you can do that will help our planet too and will grantee that we are not at fault for the destruction of our environment. If you want to limit the amount of the electricity you use to shrink your electricity bills and to actually spend less electricity and therefore preserve the natural resources, you must not only turn off all of your appliances but also unplug them from their outlets, because appliances use up to 30% of their total wattage even when they are not turned on. If you are still using old light bulbs I would suggest replacing them with compound fluorescent light bulbs or LED lights, because this way again you won’t only make the electricity consumption of your lamps smaller and therefore save money, but also LED and other bulbs that are produced with the newer technologies aren’t as harmful to produce as well as they are less harmful when they are thrown out after burning out and can be efficiently recycled. For those who want a more long term way to help the environment and aren’t afraid of an investment, it would be good to install proper insulating to your home that covers not only the ceiling but the walls and floors too, so that your home will stay cool in summer and will be warm in winter, requiring less energy to cool or warm the place. And lastly limit the amount of things you use that are meant as one-time use products. Everything from disposable plates, to paper towels and plastic bottles create a lot of unnecessary waste that many times isn’t that easily recyclable or simply goes to landfills where they take a lot of years to break down. Instead use real plates, towels and reusable water bottles to limit the amount of waste you create and how much the nature is harmed to produce new batches of these products. Recycling might not be a fun process but it definitely is necessary and beneficial. But for kids it might seem a lot of work for nothing, so there are some ways how you can teach your kids to understand the importance of recycling as well as how to make it more fun so that they continue to recycle even after they become adults. One of the things you can do is to fully explain kids why we need to recycle and how to properly do it by using different fun materials to do it. At first you can just use colorful posters or materials to explain the basics, but when they have some understanding of recycling, you can peek their interest about it with different games, science experiments as well as fun gadgets. Nowadays there are a lot of online and board games about recycling that kids can use as a fun way to spend time as well as learn more about recycling. You can also do some science experiments together with the kids for them to better understand recycling and how it happens, for example you can recycle old papers or newspapers into new paper they can draw on. And lastly in this day and age many kids will not only be entertained but will better understand recycling if you use devices to help them recycle, for example a can crusher in frog form to crush all of the lemonade cans you and your kids drink. Recycling can be fun if you make it fun for your kids. Can crusher is a tool that is used to compress aluminum cans to a smaller than its original size for disposal and recycling. There are different types of can crushers based on their size, manufacturing materials, installation position, size of cans they can compress and other specs. The main purpose of a can crusher is to ease the crushing process of aluminum cans, because mostly people are used to throwing uncrushed cans into garbage, which takes quite a lot of space, especially if you have a lot of empty aluminum cans, lets say after a party. Some people use their hands, feet or even head to compress empty soda or beer cans, which is not only dangerous as you can hurt yourself, but also is very impractical, if you need to crush more than few aluminum cans. Also children and old people may not have enough force to compress a can with their hands or feet. To ease this simple process of can crushing that requires quite a lot of force, you can use specially made devices called can crushers. Most can crusher will take cans up to 12 or 16 oz size, but there are some units that are made specially to crush just 12 oz and smaller cans and there are some crushers that will take even up to 32 oz large cans. A regular crusher will compress 12 oz aluminum can down to 1 inch, which is 4 times of its original size. This way you can store almost 4 times more cans into one garbage bag. For example a large 16 oz can can be compressed more than 8 times of its original size. Crushers are constructed to be able crush cans made from thin aluminum, which include most beer and soda cans. The construction of most personal use crusher does not allow to compress tin or steel cans, such as food cans, but there are some industrial can crushes that don’t have problems crushing steel cans, paint buckets and other containers made from durable and thick materials. Can crusher are constructed from various materials such as steel, aluminum, plastic, glass fiber and even wood, but more than 90% of all can crushers are made either from stainless steel, plastic or mixture of both materials. The majority of aluminum can crushers on the market are made from stainless steel material. Steel by itself is a very durable material, which is used in many industries to build tools that can handle very heavy loads. Thanks to decrease of steel prices in recent years, this material can also be used in much simpler and cheaper tools such as can crushers. Can crushers made from a stainless steel have better strength and durability, as well as they are corrosion resistant. You will find crushers that are made completely out of steel and ones that have some steel parts, for example steel bolts, hinges or a crushing mechanism. Although steel is the preferred material for tools such as can crushers, there are some cheaply made aluminum can crushers from steel, which will be much less durable than some plastic units, so be carefully and read all reviews of a steel can crusher before you purchase it. Most steel can crushers are wall mounted units and are painted either in black or metallic grey colors, so they are easily to spot when compared to black, matted plastic can crushers. For most, plastic does not associate with durable material that can be used to crush something expect the tool itself, but in reality some durable plastic blends are more than enough strong to be used for compressing aluminum cans. The most common material used for making plastic can crushers is nylon. 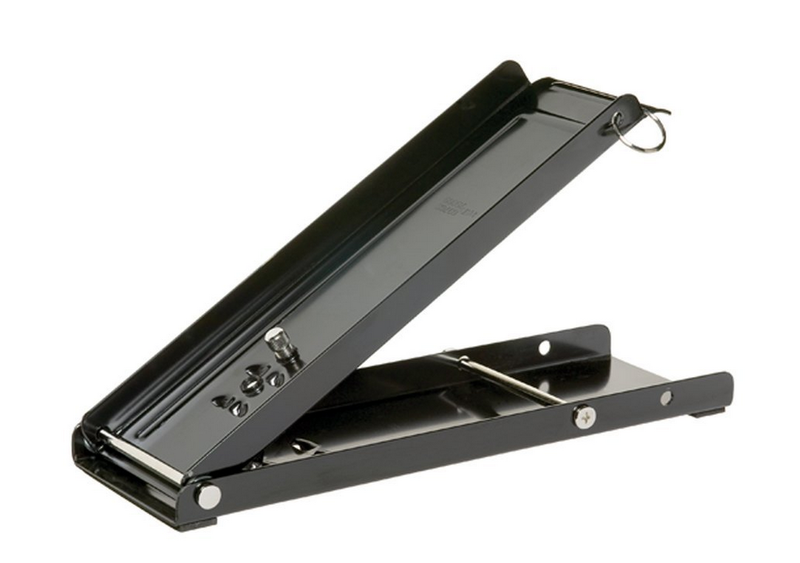 The advantage of using plastic instead of metal for making a can crusher is that it is generally cheaper to make, plastic can crusher can be used outdoors even in wet conditions, as it won’t start to rust, and also these crushers have more appealing looks than most steel crushers, as most of them are painted in a black, matte color. The thing with most plastic can crusher is that they are not fully made from plastic unlike steel units that are fully made from steel. Plastic crusher have moving parts such as different bolts and hinges made from steel to increase the durability and longevity of the tool. Plastic moving parts would be very fragile and easy to break when crushing a can. On some can crushers glass fiber or aluminum in combination with plastic is used to make the tool more durable. Besides steel and plastic also other type of materials are used to produce can crushers. For example aluminum as well as previously mentioned glass fiber in combination with plastic is used to make some units more durable. There are also some can crushers made from wood. Wooden can crushers are usually homemade units and are not for sale, because mass production of these tools would simply be too expensive. Wooden crushers often have the frame made from wood, while moving parts are made from steel and the crushing mechanism is automatic, usually hydraulic, pneumatic or other type of motor. Can crushers can be divided into few categories – operation, placement or installation position, capacity and manufacturing material. Most of the crushers you will find on the market are manual can crushers, but there are also semi-automatic and fully automatic can crushers. Manual units are the most simplest to operate and can take a single can at a time. These units also take up much less space and in most times are cheaper. From the downside, manual can crushers are slower to operate and crushing takes more effort than with semi-automatic and automatic units. On manual can crushers you need to insert, crush and take out aluminum cans one by one and there is not much else you can do to speed up this process. On semi-automatic crushers you have an option to place multiple cans in a can holder basket on top of the unit. This way you don’t have to take each can out after crushing it and place a new can in. Semi-automatic can crushers have a special opening at the bottom of the unit, so a compressed can automatically drops below the unit. Most semi-automatic can crushers can store from 4-8 cans in the can storage basket on the top of the unit. Automatic can crushers make the crushing process fully automatic, you just need to insert a can into the crusher and it will crush it automatically. These crushers are usually either homemade or industrial units that are not commercial available for individuals or are simply too expensive to use for crushing regular aluminum soda and beer cans. Aluminum can crushers have different placements – vertical, horizontal and multi position. Most can crushers are vertical or wall mounted units that need to be installed to a wall or other vertical surface. These crushers are easier to use than horizontal crushers and feature a long handle that eases the crushing process even more. Horizontal crushers, also called table top crushers, must be mounted to a horizontal surface such as a table top. These crusher are useful in places, where you simply cannot mount a vertical crusher. They take up less space than a wall mounted unit, but at the same time are not that effective and crushing process is also more difficult. This is why there are much more vertical aluminum can crushers than horizontal. Some horizontal crushers are also multi position, which means that you can mount the unit both horizontally and vertically. Besides crushers that need to be installed to some sort of surface, there are also portable crushers that don’t need to be installed to a specific surface. These are mostly foot operated can crushers that are place on the ground and allow crushing cans with your feet. One of the main ways to categorise can crushers is by their capacity or a maximum can size they can compress. The most common capacity for aluminum soda and beer cans are 12 oz, so most aluminum can crushers will compress cans up to 12 oz size. Another common capacity for aluminum cans is 16 oz, so you will find a lot of 16 oz can crushers too. The best thing about these crushers is that they can compress not only 16 oz but also 12 oz and smaller cans, which is true also with crushers that can take larger cans. Besides these, there are also crushers made specifically to compress large aluminum cans, such as energy drink cans or even plastic bottles. These units will usually take cans up to 32 oz size. You can find more info about can crusher manufacturing materials in the previous paragraph, but generally can crushers are made either from stainless steel or plastic materials, often combining them into a single unit. Can crushers from stainless steel have better strength and durability while crushers made from plastic such as nylon mostly are cheaper, resistant to corrosion and also have better looks. 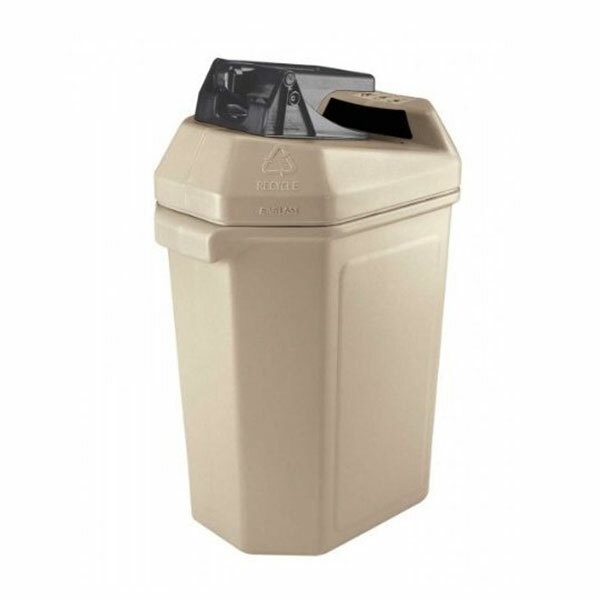 Save space in your home – A can crusher will help to save a significant amount of space in trash, which means that you will be able to stuff a lot more cans into trash bag, before driving them to a recycling point for exchange for a cash. An average can crusher will compress a 12 oz can down to approx. 1 inch height, which is 4 times smaller than a can in uncompressed size. If you have larger 16 oz or even 32 oz cans, a crusher will compress them 8 and even more times smaller, so you can store a lot more cans into a trash bag. If you are not storing aluminum cans to later take them to a recycling point, but just throwing them out into regular trash, still a compressed can will take a lot less space in your trash than a regular can. Save time and effort when recycling – Compressing cans with a can crusher is much faster and takes a lot less time than compressing them with hands or feet. Even using a regular, manual can crusher that compresses a single can at a time will be much faster and easier than trying to crush a can with you feet. Using a semi-automatic or automatic can crusher will make the crushing process a few times quicker. Help the environment – A can crusher actually motivates people to think more about the environment by doing recycling. While a can crusher obviously does not recycle aluminum, just helps to compress aluminum cans to a much smaller size, using it encourages people to store these crushed aluminum cans into one trash bag and later bring them to a recycling facility. Show kids that recycling can be fun – Using a can crusher is a great way to show your kids that recycling is actually fun and at the same time teach them the importance of recycling for our environment. Also you can bring crushed cans to a sorting facility afterwards, so your kids can also earn some cash for helping the environment. Earn money for recycling – The last but not the least benefit of using a can crusher is that bringing aluminum cans to a recycling facility will actually earn you some money. Depending on how much aluminum you bring to the recycling facility you can even earn few dozen or more dollars. 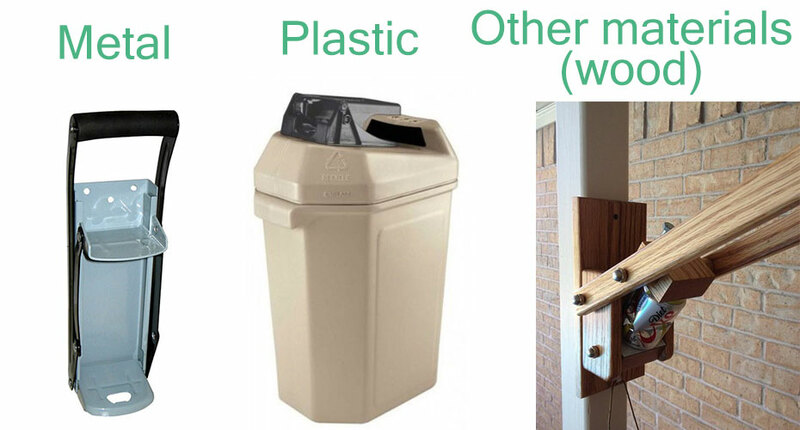 What a can crusher does is help to decrease the size of an aluminum can by compressing it 4 or more times smaller, so in a single trash bag you can store a few times more aluminum cans, which reduce the number of trips you will need to a recycling facility, so at the end you will also save some money on gas. If you have ever tried to crush lots of aluminum cans at a time with your hands and feet or with a manual can crusher, you must know how much effort it can take. This is why people and some companies have made their own automatic can crushers, which makes the crushing process more faster, effective and easier at the same time. There are various types of automatic can crushers based on technologies used to power those tools, but the most common three are – pneumatic, electric and hydraulic can crushers. The problem with automatic can crushers is that there are just few companies that make and sell these products at affordable price, which you might know if you have ever wanted to purchase such a unit, but had problems finding one. The reason behind this is that can crushing for most people is a simple and effortless process with a manual can crusher, especially if you need to crush just few cans a day or week, and no one wants to pay over 200 bucks for an automatic crusher. This is why most people choose to either purchase and use a manual or semi-automatic can crusher or to build one by themselves. Building an automatic can crusher by yourself is both fun and will cost you a lot less than finding and purchasing a commercial can crusher. You can find many interesting concepts of either a pneumatic, hydraulic or electric can crusher on the internet. We have explained what each of these types of automatic can crusher are and included a video of the most interesting ones of each category. If you want more information about different types of automatic can crushers check out this article. Pneumatic can crusher use pneumatic cylinders that work with pressurised air to compress aluminum cans. These types of automatic can crushers are the most popular ones as they are cheaper and easier to build. Here is a video of a pneumatic can crusher with a wooden frame. I liked this particular pneumatic can crusher because of its well thought construction and its practical and beautiful design. Electric can crushers have the most interesting concepts of all automatic can crushers. Electric can crushers use automatic motors, often with gear system to move the crushing plate which compresses aluminum cans. The difference between electric and pneumatic or hydraulic can crushers is that they work fully automatically, so you don’t have to press a button to compress each can, this speeds up the crushing process. Here is an interesting video showing the workings of a homemade automatic electric can crusher with a can feeding system that holds up to 7 cans. Hydraulic can crushers are the most powerful ones that are often used to compress not only small aluminum cans but also large cans and buckets made from steel. These are mostly industrial tools, so they either are very expensive or aren’t available to purchase for individuals, and most of these hydraulic can crusher are way too powerful to be used for such a simple task as crushing aluminum cans. But some people have build their own homemade hydraulic can crushers, which sure are fast and powerful tools and some of them can compress even few hundred cans in couple of minutes. Here is a video of a hydraulic can crusher that compresses over 200 cans in just 2 minutes.